The conference room just got sleeker. 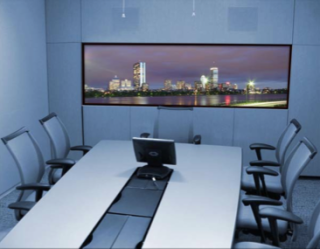 Screen Innovations has developed a new in-wall installation option for its FlexGlass rear projection screen material. FlexGlass In-wall inserts the screen into the wall for a flush fit and finish. FlexGlass In-wall inserts the screen into the wall for a flush fit and finish. The new options integrates Screen Innovations' own FlexGlass, a rollable glass projection screen with curve and custom capabilities ideal for commercial and retail installations, and its FlexGlass Rear-Pro projection screen material, delivering almost infinitely variable viewing angles and dark contrast due to its ability to reject ambient light. With FlexGlass In-wall, the screen is material inserted into a rigid frame at the job site, then mounted in a pre-cut opening. Screen Innovation provides integrators with a template and step-by-step instructions to cut a precise opening in the wall. FlexGlass is made from the same material as bulletproof glass, and is available in screens up to 9’ high and 99’ wide, allowing the best in flexibility, strength, and performance. It offers the benefits of the best rigid optical glass and panels, and, because it’s semi-rigid, FlexGlass can be used in curved configurations ideal for retail, in-window displays, exhibits, houses of worship, board rooms, corporate lobbies, and more. It can also be rolled in long, seamless sheets on 24” diameter cores, eliminating the logistical problems associated with moving rigid glass or Plexiglas sheets into and through buildings, elevators, and small doorways. Screen Innovations showed the FlexGlass In-wall at InfoComm last week.